The Indie Spirit nominee is still taken with Aneesh Chaganty's clever screen-centric thriller, but its forward-thinking goes beyond just cool technology. The technological demands of Aneesh Chaganty’s feature directorial debut “Searching” were profound. A computer-screen thriller that unfolds on various displays, zinging from laptop to laptop and back again, Chaganty’s film required a canny handle on technology and the way it looks and moves, but it also needed an actor able to root the family-centric film in emotion and humanity. That came from the inspired casting of the always-reliable John Cho as David Kim, a recent widower who must use all his smarts (and a ton of literal screen time) to find his missing teenage daughter Margot. The “Star Trek” and “Columbus” actor delivered, turning in a nuanced performance in a film that could have been dominated by on-screen wizardry. 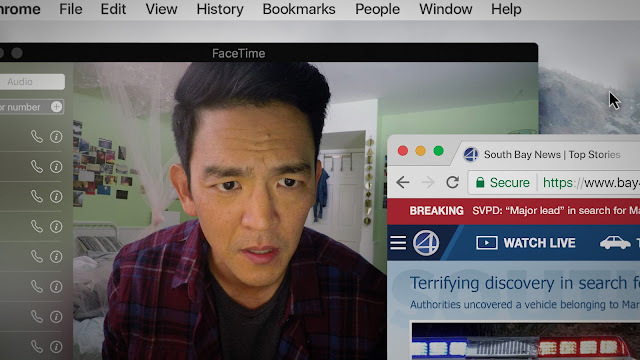 While a film like “Searching” could impress by virtue of craftsmanship and technology that makes it feel so contemporary and true-to-life — this is the rare internet-centric film that utilizes existing apps and websites, no weird “Facebook” knockoffs here — the casting of Cho allowed Chaganty’s feature to tap into modern sensibilities in another way. Cho, a Korean-American actor, has always mixed up his roles, from those that hinge on his cultural background (from the “Harold and Kumar” films to Justin Lin’s “Better Luck Tomorrow”) and those that don’t (like Kogonada’s “Columbus” and his early supporting work in the “American Pie” series). “Searching” fell under the latter categorization, a film in which Cho’s race wasn’t baked into the narrative and a colorblind casting that he’s hoping to see more of in Hollywood. The film premiered under the title “Search” at the 2018 Sundance Film Festival, where it was quickly picked up by Sony’s Screen Gems arm. The studio released the indie in late August, where it went on to make more than $70 million worldwide. Not bad for a film that reportedly cost about $1 million to make. Cho’s recent Indie Spirit nomination for Best Male Lead, pitting him against contenders like Ethan Hawke and Joaquin Phoenix, took him by surprise, but it also reminded Cho of just how exceptional the film has proven to be. For Cho, who has long moved between indie films and studio pictures, the expectations that scared him about the role were rooted in the demands of making a film that takes place on computer screens. For the majority of the feature, his David is stuck staring into his and Margot’s laptop screens, only occasionally interacting with others through chats, emails, and “live” videos. It’s insular work. Cho is eager to deflect praise to not only Chaganty, but also to the rest of the creative team that made his performance look so good inside a universe that was created and constructed long after he had filmed his scenes. (Bekmambetov also produced “Searching” and has been vocal about his dedication to making a ton more screen films in the coming years.) For Cho, the recent uptick in such films has been a matter of not only technology catching up, but also the public understanding how it can all work as entertainment. Cho also thinks the tide is turning when it comes to the other kind of on-screen representation that “Searching” so easily utilized. Recent blockbuster successes like “Black Panther,” “Get Out,” “Hidden Figures,” and “Wonder Woman” prove that diverse films can make a lot of money, while a 2017 study crunched the numbers and came to the same conclusion. With over 20 years of acting experience, Cho resists the idea that he’s gotten more picky as his star has risen. Instead, he offers that his success comes from something more personal, the kind of emotional intelligence that made his work in “Searching” so compelling.